This entry was posted on Freitag, Mai 6th, 2005 at 00:00	and is filed under best shots, black and white, building, gallery. You can follow any responses to this entry through the RSS 2.0 feed. You can leave a response, or trackback from your own site. Another beautifully composed shot, this floor pattern is a great subject and you have a great eye for amking the most of it. fantastic composition this shot… I really dig this one and the one before! 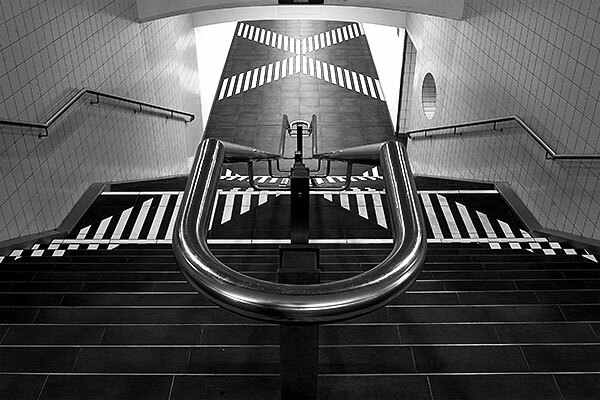 It’s the floor patterns that carry these shots so well – nicely composed with the rail curving in the middle. great shot! i like the quasi-symetry and the vector geometry. Mathematical shot. Is this a subway station? It’s really beautiful, and you managed to capture that beauty quite well. Another great photo, I keep staring at it because it’s so nicely centered. No, they haven�t got a subway in Wolfsburg. It�s a train station near the Volkswagen factory.